Getting enough Protein in your Diet? Our obsession with health leads us to different trends that continue to appear. “This is good for that. That is goo for this.” This too often creates imbalance in the body and mostly in the mind. We can’t seem to figure out the magic formula for perfect health. The trying to figure it out part is the confusing part. We should look to simplify our thinking about food and look to eat a balance of all things without being obsessive of how much of each we need to intake daily. Try to allow your body to adjust to the changes that it goes through daily and you will/may begin to feel it tuning itself to its natural state. Take what you need not what you want and you will see changes. Here’s a great article i found that may answer a few questions for ya or give you a little more insight on what you may be consuming. Have you ever seen one of those documentaries of people in third-world countries and saw the small amount of food that they eat? They have no concept of overeating. We feel sorry for them, but we’re the one’s suffering! Our nation has become so greed stricken and money hungry that food has become nothing more than dollar signs to the large food corporations, and we’ve become they’re food addicts. So much is centered around food. It’s advertised everywhere. Here you are driving home thinking of the chores that you need to complete and there’s a billboard for ice cream. You think to yourself, umm, a bowl of ice cream would be good after dinner. You stop by the store for ice cream. You get home and wonder why you have so many bags of groceries. You had to get cookies to go along with the ice cream, and you also decided that you haven’t had a banana split in a long time so you buy everything that goes into making one. Soon, your single idea of having one treat has been blown out of proportion. Think for a minute about who gives us the information that we have regarding the amount of food that we need. 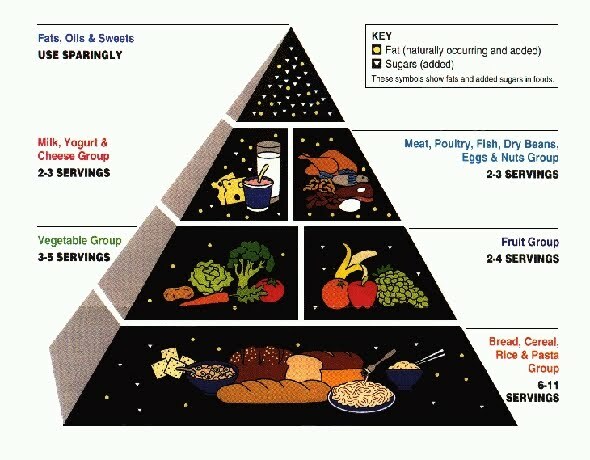 Think about the food pyramid and all of the many things that are included in it. It’s so funny, when I try to diet with a weight loss program, I am always hungry. I’ve never liked dieting, not because I was restricted, hell I need restriction, but because every two hours I was hungry!!!! I was told that I needed to eat every two hours, but why? How can diet companies package foods and create foods that are a facsimile of the natural thing. I keep seeing Special K create drinks and packaged foods, but what about natural foods. Oh that’s it, Special K doesn’t have any natural foods. I mean there aren’t any bananas or cherries that are labeled Special K. All that I know is that eating raw curbs my appetite and helps me to learn that I really don’t need all of the food that the diet and drug industry tells me I do. So what’s one to do who’s learning their way around the raw food diet? I’ve had someone try to debate me, and I say try, because everyone has their own opinion and I’m not about to argue with anyone regarding their point of view, but this person was telling me that I’d run the risk of not consuming enough calories and that I’d go into starvation mode. So how can I be starving myself if I’m giving my body the nutrients that it needs? Not food, but nutrients! When we consume the standard American diet we’re consuming food, but not nutrients. This is why I feel we instinctively eat when we’re not hungry due to our body still needing nutrients. To me eating is not about having food, but what it’s really about and should be about is consuming nutrients that will help the body to heal, regenerate, reproduce, excel, flourish, develop, grow, and repair. I think we’ve become consumed with the actual motion of eating. We have removed the association of nutrition from our diets. All that we see and are driven by is the need to remove the hungry feeling. We’re not focused on eating to live or be healthy, but just to eat, and when we do we simply seek out food that we enjoy. Does anybody get what I’m saying? As for myself, when I’m being conscience and eating raw, I choose to eat when I’m physically hungry, and I try to eat what my body needs and not what my eyes desire. If having a green smoothie satisfies my body, then that’s all I need. Yes, I do need a certain amount of calories to live, and when I feel hungry due to not having enough nutrients to fuel my body, then I will eat. Part of the reason that we lose weight when we eat a raw food diet is because our cells are not overloaded with processed toxic ridden foods. This allows our cells to function as they should. Did you know that your pancreas and liver work very hard at removing toxins and stored lipids from your cells. In doing so, it allows your body to be in a metabolismic (is that a word) state of homeostasis , but when we constantly put junk in, we get junk out. The foods that we constantly consume causes us to store more and more toxins and fats in our cells. When we diet (calorie restrict) on popular diet plans we simply just reduce the amount that we eat, but the foods are the same. Jenny Craig offers packaged foods that you’re to consume, and the plan urges you to eat fruits and vegetables. You lose weight, but when you return to your old habits, the weight returns. You’ve changed the amount of calories your body needs, but you’re still adding more toxins and fats, not necessarily from the foods, but from what those types of processed foods do to you. Do you see how it’s not necessarily how much your eat, but what you eat? I will continue on the raw food journey until success is mine. I will continue to train myself to eat when I’m hungry and not when I desire. I will work towards training my mind to resist foods that aren’t healthy for me. And, I will work even harder at developing the motto that junk in equals junk out, but raw in equals junk out and fat gone! There are so many wonderful aspects to eating a raw food diet that you don’t even know yet. People, people, take back your power and do what’s right for you and your body. No one can tell you what YOU need. Become your own nutritionist and use food for it’s proper purpose – nourishment. Do something great and nourish your body today?